The strange and haunting tale of a rat-eating real-life bogeyman called Catman. In the back alleys of Greenock Scotland, a legendary creature lurks, ready to scare local children, or give you the fright of your life on the way home from a night on the town. Blackened face and glowing eyes, the Catman of Greenock lives in the town, and for decades residents have spotted him crawling around lanes, under cars and buses, often with a rat in his mouth. The story of the Catman of Greenock is a harrowing one, going back decades to the heyday of the Scottish shipbuilding industry. Legend has it that Catman is a Russian sailor, who became stranded and was left to fend for him self, homeless and hiding away from people. eating what wild animals he could catch, The whispers began when the industry began to decline in the 70’s, and for decades there were sightings, and tales of children encountering Catman and daring each other to see how far they would venture into an abandoned railway tunnel near his ‘den’. A “Catman” was a job in the shipyard. Companies would employ someone to keep a bunch of cats at the yard to keep the rats at bay, But it looks like this Catman ended up inviting the rats in for dinner. He quickly turned into local myth, and although sightings of him subsided through the eighties and nineties, here was always someone about that would vouch they had seen him, or had left him some food, or a cup of tea, and his ‘den’ was easily visible with the signs of someone living there. 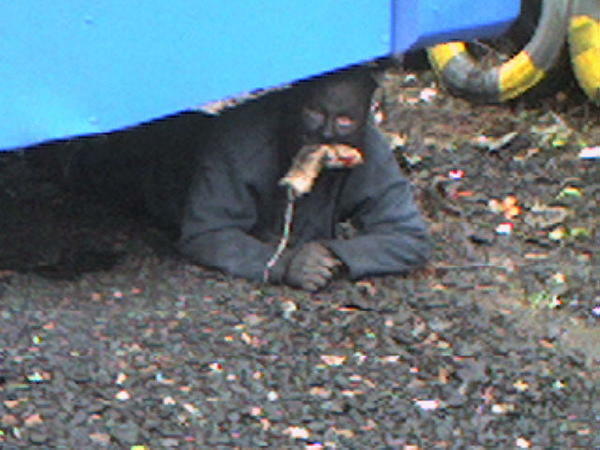 The advent of mobile phones heralded the new age of Catman, one where he can be clearly seen in footage dragging himself about on the ground, blackened face and rat in mouth, The footage appeared a few years ago and spread like wildfire amongst locals, then appeared on Youtube and even made it onto the pages of a national newspaper. In this disturbing footage he is silent; some people say a gang broke his legs and cut out his tongue, however he gives the cameraman a ‘thumbs up’ and looks almost content. There was outrage – how could a person be left to live like this? 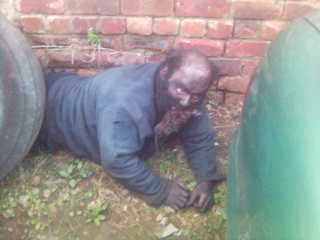 The publicity prompted the local Social Services to investigate, and check on Catman’s health and assist him. Some people say that he has been institutionalised, but didn’t like it and prefers to live on the street. Very recent photographs have emerged from April 2015 showing Catman lying down, with a takeaway chip box in the foreground, the punter that brought him it squatting next to him, grinning that they’ve caught the legend on film. Catman doesn’t seem bothered. In fact, he’s giving the thumbs up, like a side show freak, pleased with their own act. As people continue to speculate on whether Catman is real or some kind of modern bogeyman there can be no denying the amount of people that claim to have seen him, in all his despairing glory. There’s now even a Facebook Fan page where people can share there photos and stories. Sadly it has been reported that he has recently been taken to a hospital, although this has not been substantiated. Perhaps if true, the medical staff may finally uncover the secrets of Catman’s past and how he has managed to survive for so long in such a wretched state. he’s real. it’s strange seeing this develop into an urban legend type myth over the years on the internet. he’s just a homeless guy living rough in the town, i seen him constantly in my childhood and so have most people I know from the east end of greenock. He’s rarely seen since the video went viral around a decade ago but occasionally people will see him late at night. I don’t know how long this has been goin on for sure but I first seen him the 80s and last seen him about 7 yers ago. I was shocked when people told me they seen him this year, i thought he had died. its hard to believe but its all true he really has been living like this all these decades. half of greenock still think its some kind of urban legend, so authorities or media dont seem interested in the case.